Join TRIO SEFARDI to celebrate the release of their newest CD, La Yave d’Espanya (The Key from Spain). Susan Gaeta, Tina Chancey and Howard Bass will perform music from Turkey and the Balkans, old and new Sephardic favorites on the customary topics of love and courtship, holiday fun, and, in particular, life’s journeys. They’ll feature one of their mentor Flory Jagoda’s most important songs, Sviraj Harmoniku (Play Your Accordion), composed when teen-age Flory fled Zagreb in 1941 in the wake of the Nazi occupation; she brought this song to light more than 60 years later, and this is its premier recording. The title song relates the story of how the Sephardim, exiled from Spain in 1492, took the keys from their homes and passed them through the generations, in hopes of someday returning. Trio Sefardi is a confluence of three performers who share a love of and wide-ranging experience with Sephardic music, playing with La Rondinella, the Western Wind, and National Heritage Fellowship honoree Flory Jagoda. Washington Post chief music critic Ann Midgette praised the group’s “lovely and luminous performance of Sephardic songs” and vocalist Susan Gaeta’s voice as “compelling” in a review of a recent performance at the Kennedy Center with the Post-Classical Ensemble. Group members combine a respect for tradition with a creative approach to arranging and scoring dedicated to bringing the vibrant past into the living present. Trio Sefardi’s first public performance was at the Kennedy Center’s Millennium Stage in November 2010. Since then the group has performed at the Washington Folk Festival, the Takoma Park Folk Festival, the National Gallery of Art, Southern Methodist University, the residence of the Spanish Ambassador, and many other local venues. In December 2011 they were featured performers in the Washington Revels production, “Andalusian Treasures,” at Lisner Auditorium in Washington, D.C.
We invite you to enjoy delicious refreshments from the Café at Carroll Café available before the show and at the intermission. A changing choice of savories enough for a light meal, topped off with fabulous desserts and beverages, will add to the happiness of the concert experience! Always vegetarian, with some vegan and gluten-free options most months, all lovingly provided by Sandra and Okima. With the fated combination of unique skill, varied musical influence, and honest storytelling, RICHIE AND ROSIE play music that people can connect with. Before joining forces, both members were well established within the old-time community. Rosie has toured with multiple bands, including an appearance while she was in high school with folk-rock band The Mammals. In 2010, she released a self-titled album as part of the duo The Pearly Snaps. In addition to two solo albums, Richie’s discography includes collaborations with Natalie Merchant, Jim Lauderdale, Donna the Buffalo, and Carrie Rodriguez. He has performed internationally with Bela Fleck, Pete Seeger, David Byrne, Billy Bragg & Wilco, Old Crow Medicine Show, and Joan Baez. He is president of the iconic GrassRoots Festival of Music & Dance. As musicians in two very different parts of life, Richie and Rosie are proof of two things: the power and magic of two people making music, and that the universal messages that lie within their songs remain timeless. December 14, 2018, at 7:30 p.m.
A Takoma Park, Maryland, resident, blues musician, teacher and artistic director, two-time winner of the prestigious WC Handy Blues Foundation awards, Phil is only the third harmonica player to receive the lifetime honor of an NEA National Heritage Fellowship. Today he is the only living player of the instrument to hold the prestigious honor of being a “Master of Traditional Arts.” Often referred to by its unofficial designation as “Living Cultural Treasure” award, the fellowship honors and preserves the diverse cultural heritage in the United States. The National Endowment for the Arts (NEA) annually awards one-time-only NEA National Heritage Fellowships to master folk and traditional artists, to recognize lifetime achievement, artistic excellence, and contributions to our nation’s traditional arts heritage. Phil is joined by the Chesapeake Sheiks—Matt Kelly on guitar, Marcus Moore on violin, Ian Walters on piano, and Steve Wolf on bass—playing blues from the Piedmont and Delta as well as the music of Duke Ellington, Louis Armstrong, Django Reinhardt, Louis Jordan, Slim and Slam, and originals. NOVEMBER 9, 2018, at 7:30 p.m. 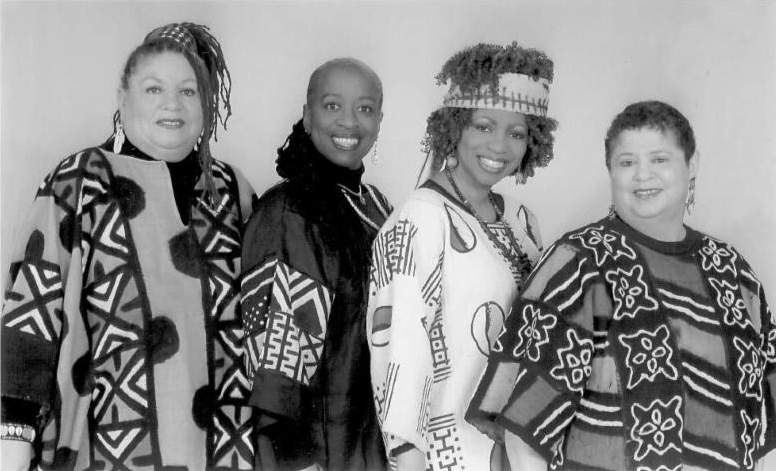 IN PROCESS…, an African American women’s a cappella ensemble, originated in the DC Metropolitan Area from a Sweet Honey workshop. For over 30 years the rhythmic, harmonic, consciousness-raising music messages of In Process… have been heard locally and in venues from Arizona to West Virginia. Her blended repertoire includes spirituals, gospel, jazz, blues, and historic and original contemporary songs of love, freedom, peace and justice. In Process… has two CDs, IN PROCESS… and MISSION: LOVE and her original music is featured in the Anacostia Watershed Society’s documentary “The Anacostia: Restoring the People’s River.” More than 50 women have passed through In Process…, which today features Nketia Agyeman, Pam Rogers, Paula Pree, and Tiya! MAGPIE (Terry Leonino and Greg Artzner) have been playing music together since 1973, and this concert marks their incredible 45th anniversary of playing in D.C. Since their last appearance at Carroll Café they have released a new CD–When We Stand Together: Songs of Joe Hill, the IWW and Fellow Workers. A gifted singer of jazz and blues in the tradition of Connie Boswell and Billie Holiday Terry is equally comfortable with the subtle beauty of traditional folk and contemporary songs and has an uncanny ability to find the perfect harmony line. She is also an excellent player of the harmonica, mandolin, fretted dulcimer, and rhythm guitar. Greg is an outstanding guitarist whose fingerpicking forms the solid basis of Magpie’s sound, providing whatever is called for, from slow Scots airs and plaintive ballads to rollicking ragtime blues and infectious swing. His high baritone voice has equal range, and his captivating interpretation gives power and beauty to the full spectrum, from growling blues, to a Chilean lament, to a sweet croon. From the beginning Terry and Greg’s interests in various musical styles have led them to be eclectic in their repertoire. Internationally known for their musical work in the environmental movement, Magpie is also well known for their performances of hard-hitting topical songs and are regular performers on Phil Ochs Song Nights, organized by Phil’s sister, Sonny Ochs. Magpie has been on hiatus since early June, so come help welcome them back to the stage!